The 2019 Volkswagen Jetta S isn’t your typical base trim level. With a turbocharged engine and an array of modern amenities inside this car, the VW Jetta S has a lot to like for drivers in Irving, Grand Prairie, Grapevine, and Dallas who are looking for a new sedan. 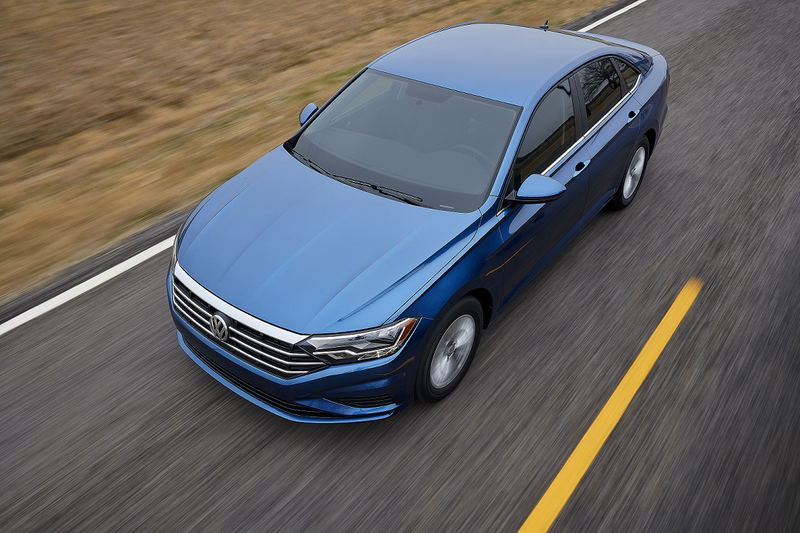 Here at Metro VW, we put together this 2019 Volkswagen Jetta S review to give you a closer look at what you’ll get when buying or leasing the 2019 VW Jetta S.
The Volkswagen Jetta S is powered by the exhilarating 1.4L TSI® 4-cylinder engine that produces 147 horsepower and 184 lb-ft of torque. With this engine comes a 6-speed manual transmission for complete control and responsive acceleration. The exterior of the 2019 Volkswagen Jetta S brings a sleek, tasteful design to the modern appeal of the sedan. Part sporty and part luxury, the outside of the VW Jetta S has exceptional craftsmanship across the whole body. It also features LED headlights, LED Daytime Running Lights (DRL), and LED taillights, helping the vehicle shine bright and clear. The power-operated side mirrors will give you the ability to adjust their position so you can get a clear view of your surroundings. They even have an available heated feature as well. The 2019 VW Jetta S comes with the VW Car-Net® App-Connect that gives you the ability to connect your smartphone to your vehicle. Using this system, you can plug in your device and connect it to the 6.5-inch touchscreen display in the Volkswagen Jetta S with Apple CarPlay™ or Android Auto™. By doing this, you will have control over various functions of your phone like the ability to make calls, use your maps application, listen to custom playlists, and more. The VW Jetta S also comes with Driver personalization. This technology will let the car remember your personal preferences for a handful of settings—each time you get inside the car it will be able to adjust the various systems accordingly. You will also be able to store up to four different driver profiles, so other family members can set things up to their liking as well. There are also systems in place to keep you safe while riding around in the 2019 Volkswagen Jetta S. From the Electronic Stability Control (ESC) to the Anti-Slip Regulation (ASR) to the Hydraulic Brake Assist (HBA), the VW Jetta S is engineered to keep you in control at all times. The car also comes with a Rear View Camera System. This shows you a live feed on your display screen of what is behind your car while in reverse so you can confidently back out of your driveway or parking spot. Interested in checking out the 2019 Volkswagen Jetta S in person? Drivers in Irving, Grand Prairie, Grapevine, and Dallas can stop by Metro VW to see our inventory of various VW Jetta S models. Also make sure to schedule a test drive when you visit us! *30 city/40 highway (2019 1.4L, 6-speed manual transmission). EPA estimates. Your mileage will vary and depends on several factors, including your driving habits and vehicle condition.